I read this earlier today and I simply can not let this go ignored! So clearly Boehner’s posse is seeking revenge against those who voted for someone other then him as Speaker of the House on Tuesday. One of those lackey’s is Republican Rep Devin Nunes from California. For a second I thought I was living in Russia, Cuba, or China-I mean, seriously…..ummmm seriously? Last time I checked, this is a Constitutional Republic and well we the people are noticing the Constitution is being ignored! HELLOOOOOOOOO the people didn’t want Boehner re-elected, but our representatives went it alone, not representing their constitutes. You know I don’t even think we should call them Representatives anymore because they have stopped representing us! Now I totally get that this resolution no way in hell will pass, because I gotta believe that there are still those that believe in FREEDOM and well…geeez the ability to I don’t know-vote for the people not the politicians! 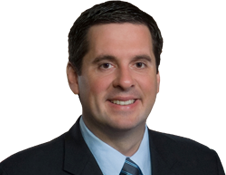 I am hoping Devin Nunes is searching for work when it comes to elections in 2016….or I gotta better idea, it’s probably best he move to a country that is not represented by the PEOPLE. At least ONE of em’ has a pair!